Join the world's best mobile chat service. Millions & Millions of users, Hundreds of thousands of fun chatrooms, MSN, Yahoo!, AIM, GTalk, emoticons, profiles, photos, themes, email, calls, SMS & more! This is an IM client which supports Access to your AIM, MSN,Yahoo, Skype and Google accounts. The Program is totally free but just requires quick registration in order to download and receive a user name and password. With this program you can link the online photo sharing account you already have to JiveSlide. The current release of JiveSlide supports public folders from Yahoo Photos and Photo Sets on Flickr, with more supported services coming soon. Linking your account is as easy as entering your Yahoo username. Share your photos online, then view them on your BlackBerry. Instantly. ShoZu on your BlackBerry lets you stay connected to the people and sites that matter while you’re on the go. Access Flickr, YouTube, Blogger, Facebook and more. Tag and upload photos and videos directly to popular sites - even share them with friends. Access your online life anywhere your offline life takes you. This is a blogging program for the BlackBerry which lets you blog instantly with, audio, video, photo, text support for all your favorite social sites, including myspace, Facebook, blogger, Flickr, YouTube, Twitter, and more. Get Live Messenger on your blackberry, Connect to all your contacts as you would on your computer. This program is really well done looks almost exactly like the Windows version. Imagine your mobile phone knows the basics of who you are and who you'd like to meet (a romantic partner, a fellow hobby enthusiast, a friend), imagine that your phone interacts with other phones around (in the same cafe, supermarket, city block) and alerts both of you when Who You Are and Who You'd Like to Meet coincide. 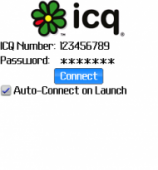 Connect to your ICQ contacts directly from you BlackBerry. Google's IM Messenger for the BlackBerry.